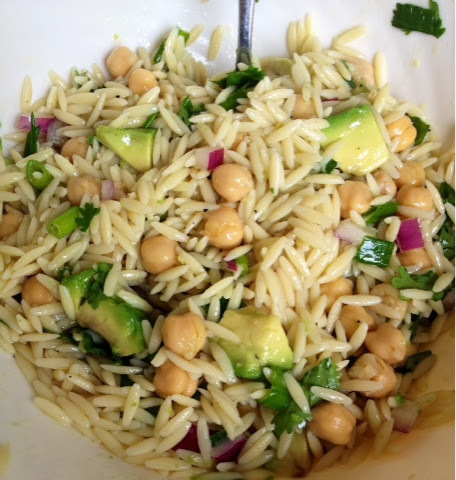 I helped out my friend, Emily, with some yard work this weekend and she fed me this tasty orzo salad for lunch. I liked it so much that I made it again this week and wanted to share the recipe with all of you! I don't eat pasta often, but when I do, I put lots of veggies in it. 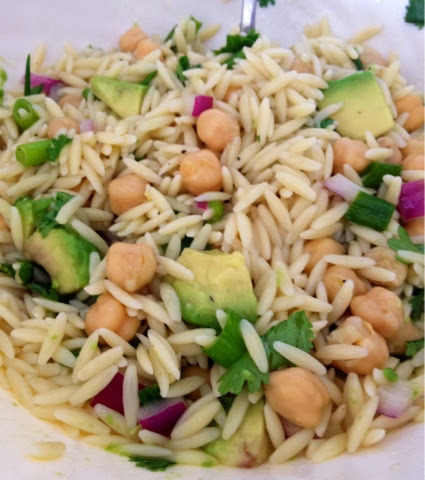 This orzo salad has just that and it makes a perfect lunch or side dish. Plus, I'm carbo-loading right now. Thanks Emily! Cook orzo according to package directions. Let cool and place in a large bowl. Mix in all of the other ingredients, waiting to add the goat cheese and/or avocado until serving. Mix the ingredients of the red wine vinaigrette in a food processor until smooth. Pour over the orzo mixture and mix in. Leftovers can be put in the fridge for up to a week (this recipe makes a pretty large batch). I like to set it out at room temperature before serving so it's not too cold. Do you steal recipes from your friends? Have you ever added goat cheese or avocado to pasta? This looks delicious! I will definitely need to try it out for lunch!